As the stock market, and homebuilders in particular, experience difficulty, it could put pressure on the Fed to ease its pace of interest rate hikes. Homebuilder shares plunged 40 percent from their mid-January high, a move reminiscent of their pre-financial crisis move starting in 2004. Mortgage rates hitting 5 percent could represent an important inflection point for housing. If there's a case to be made for the Federal Reserve to hold fire on interest rate hikes, it's happening now in the housing market and the stocks that track the industry. 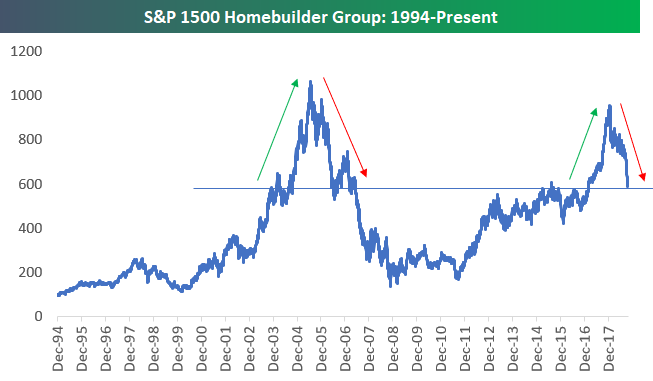 Homebuilder shares in the S&P 1500 recently sank 40 percent from their mid-January high. The move mirrors the early 2004 tumble that ultimately foreshadowed the coming housing collapse, which triggered the financial crisis, Bespoke Investment Group pointed out. The most recent drop in the builders has come in tandem with the rise in the 10-year Treasury yield, the benchmark for most other rates. The note moved from a low of 2.82 percent on Aug. 22 to eclipse the critical 3 percent level, where it appears to be staying. That, in turn, has coincided with a rise in mortgage rates to near 5 percent, which some experts say could be a major inflection point for the housing market. "We know we're going to hold above 5 percent. The word is starting to get out," said Danielle DiMartino Booth, CEO of Quill Intelligence and an advisor to former Dallas Fed President Richard Fisher during the financial crisis. "That's one of those toxic things for residential real estate." Real estate sales have been on a rough ride lately, with existing homes down 3.4 percent in September. Mortgage applications were down 7.1 percent for the most recent week. With the talk of mortgage rates getting to 5 percent — Bankrate.com currently puts the average at 4.88 percent — has come chatter that the Fed will need to back off what looks like a pretty aggressive schedule for rate increases ahead. CNBC's Jim Cramer floated the idea Monday that the Fed will be "one and done" after a much-anticipated increase in December, and the notion seems to be catching. Fed funds futures trading pointed to a 77.2 percent chance of a December move, which would be the fourth of the year. While that's still high, it is well below the 87 percent probability from Monday. Another hike in March, given a 61.8 percent likelihood on Monday, was down to 51.2 percent Tuesday, according to the CME's FedWatch tool. Probabilities for subsequent months in 2019 also faded with Tuesday's stock market decline. At the same time, homebuilder stocks were one of the few positive groups during the drop, which sent the Dow industrials plummeting as much as 500 points at one juncture before halving the losses in afternoon trading. The iShares U.S. Home Construction ETF surged more than 3 percent on the day. The action showed some early pricing of hopes for a more dovish Fed. "Here we are with mortgage rates close to 5 percent, and we're getting lots of anecdotal evidence that things are slowing in the housing market," Ed Yardeni, founder of Yardeni Research, said on CNBC's "Squawk on the Street." "Housing isn't what it used to be, but it still has a lot of knock-on effects for other sectors of the economy." "Maybe we are spending too much time focusing on the Fed speeches and all that, he added. "But the market tends to do that, and I think we are going to have to see the Fed back off, and that's when I think the market starts to show signs of relief." So far, though, Fed officials have indicated just the opposite. Chairman Jerome Powell rattled markets a few weeks ago when he said the central bank has "a long way" to go to get to its desired "neutral" rate that is neither stimulative nor restrictive. Minutes from the September meeting showed a widespread commitment to continue the normalization process, and Atlanta Fed President Raphael Bostic said in a speech Tuesday that "there is little reason to keep our foot on the gas pedal." Things can change quickly on the Fed, though, and Powell will have ample opportunity to signal a shift if one is necessary. Starting in January, he will begin holding news conferences after every Federal Open Market Committee meeting, as opposed to the quarterly sessions now. "He has the podium January 30, so he's got the opportunity to lay the groundwork to pause in March ... if things get ugly," DiMartino Booth said. "If he's desperate for optionality, then he can set up the market with the December statement to indicate somehow that it is not just a March-June-September-December event" for rate hikes. Should the market continue to deteriorate, and particularly the housing aspect, she said "the Street value of the January press conference is going to go way up." WATCH: How long-term investors should handle sell-offs like the market saw Tuesday.